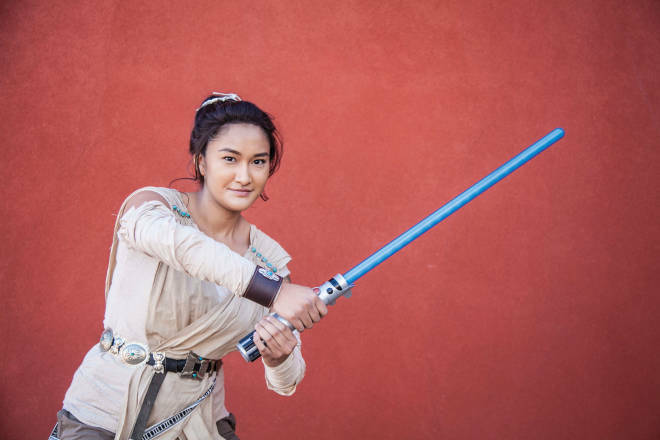 Above: Dezbah Evans in costume at last year&apos;s Indigenous Comic Con as Rey from the Star Wars series. Photography by Gabriela Campos. Zombies have seized popular culture, from The Simpsons to an undead Pride and Prejudice. But what would the zombie apocalypse look like in Indian Country? That was a serious topic of conversation at the first Indigenous Comic Con last year, when two speakers, Johnnie Jae and Jackie Malstrom, offered this encouragement: Native Americans have already survived one apocalypse; those skills can surely scare the zombies away. “There’s a perception of Native people that we’re very serious,” says Lee Francis, a member of Laguna Pueblo who founded the Indigenous Comic Con. “But Native humor is incredibly funny, incredibly powerful, and incredibly profound.” Francis also started Native Realities Press, which publishes comics, games, and graphic novels. Building on the success of last year’s con, Francis opened a retail store this year in downtown Albuquerque. Red Planet carries books, comics, games, and art by Native creators. Among the standouts you’ll see at this year’s con: Arigon Starr, creator of the Super Indian comic (her hero got his powers from eating tainted commodity cheese); Jay Odjick, who started the Canadian comic and subsequent TV series Kagagi; Jon Proudstar, creator of Tribal Force, the first all-Native superhero comic; actor Eugene Brave Rock, who had a key role in this year’s Wonder Woman film; and astronaut John Herrington, the first Native American in space. Get hands-on with robotics, a maker space, cooking demos, skateboarding, and mixed martial arts. And pick up a first edition of Native Realities’ Deer Woman anthology, in which Native women writers and artists apply a feminist edge to traditional stories of survival and healing.